Exploring Cambodian cuisine and its local flavors is a journey full of surprises. While eating our way through Southeast Asia, we hadn’t put much thought into Cambodian food. We were still raving about Pho and Bánh Mì after leaving Vietnam. And we had been wowed by Bangkok street food. With Cambodia been tucked between Vietnam and Thailand, we assumed that Cambodian cuisine would somehow be related to these two countries. Needless to say, that was a very limited view of Cambodian cuisine. Certainly, Cambodia foods have their own unique characteristics, flavors, and tastes. 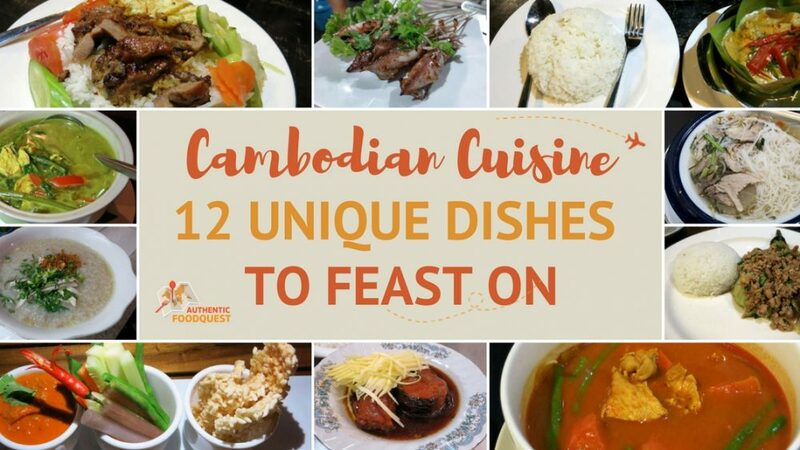 Let’s explore the 12 Cambodian dishes that will have you delight on the unique flavors of Cambodian cuisine! When visiting the Kingdom of Cambodia, Amok, the national dish is not to be missed. While you may be offered a variety of Amok versions, the most authentic and local is Fish Amok. Fish amok is a sublime combination of fresh river fish (often snakehead) and coconut cream, steamed in banana leaves. It is absolutely delicious, moist and elegant. The unique Cambodian ingredient in this dish is Kroeung, a curry paste, which gives it a distinct flavor. The dish is served with a side of rice. You will find Amok available at several restaurants. To make sure you are getting the local and traditional version, here a couple of helpful hints. The traditional dish is Fish Amok, if you are offered “chicken”, “beef” or “vegetarian” options, the restaurant is appealing to tourists. Amok is always steamed. If it is prepared in any other way, it is not following the traditional recipe. Finally, make sure the fish is local river fish. Snakehead is the popular local fish. Stay away from other types of fish. We had this Khmer dish several times in Phnom Penh and Siem Reap. We highlight below Khmer Women’s Restaurant in Phnom Penh as one place to enjoy Cambodian cuisine. 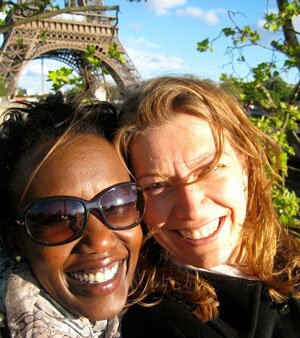 We liked this restaurant not only for the delicious food but also because it empowers women with jobs and skills, helping them move forward from the horrors of the country’s past. When it comes to local breakfast specialties, there is one dish that rises above the rest. Kuyteav is the capital’s undisputed pride. This extremely popular breakfast is a rich broth made from pork bones, dried squid and a generous amount of condiments and garnish. Kuyteav Phnom Penh as the local version is called, takes the dish to the next level by adding giant prawns from the Mekong river and beef offal. While it is an unusual breakfast for Westerners, we were amazed by the depth of flavors. We found it simple, tasty and enjoyed the vermicelli noodles with carrots, greens, and turnip. This typical Khmer food for breakfast is to be savored on your trip to Cambodia. This is a really local market with friendly vendors. You will not see any tourists and you will get a glimpse into the daily life of locals in Siem Reap. Find the stall on the left-hand side of the market when you are facing it. If you see the lady from the picture, you’re in good hands! 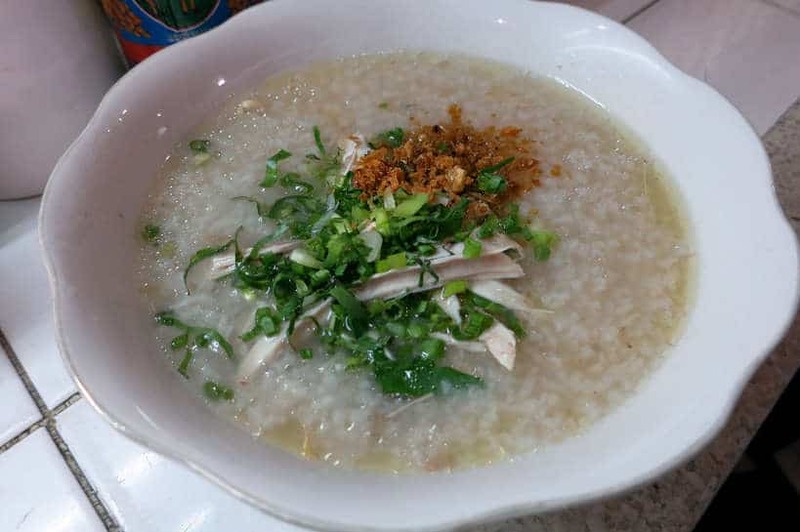 Bobor is a rice porridge, typically served with ginger and fish or poultry. It is a popular dish for breakfast and evenings amongst local workers. The simplicity of this Cambodian food makes it a popular option. 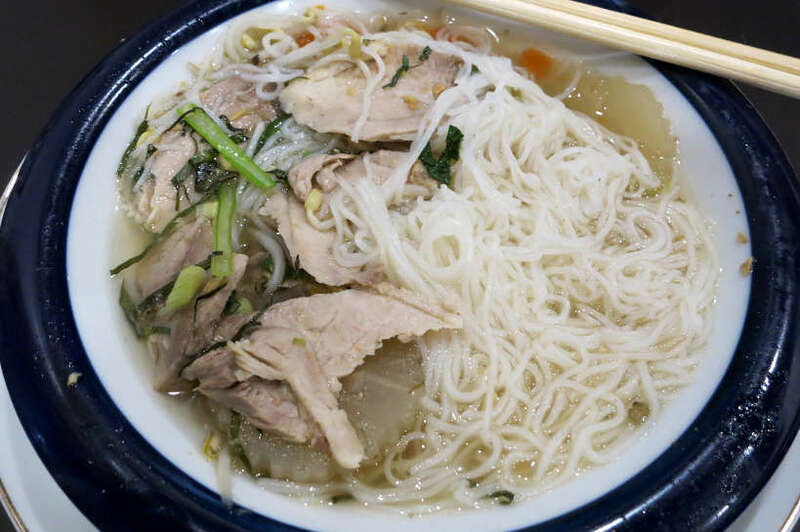 It is a thick and flavorful soup, with either chicken or fish, congealed blood, and offal. Sitting on top of the porridge is ginger, coriander, and crunchy fried onions. We tried the porridge with both chicken and fish, and ultimately preferred the fish version. It is tasty, easy to eat and surprisingly light. In addition to the delicious taste, it is also one of the cheapest meals you’ll find. 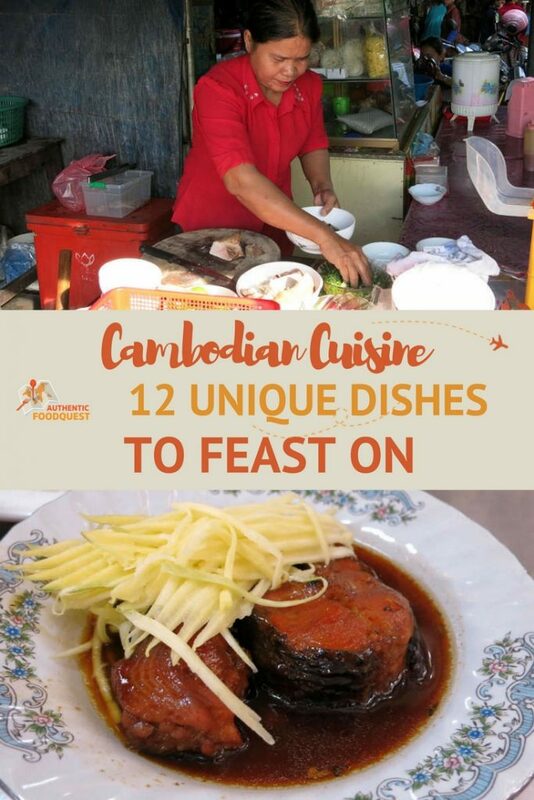 Be sure to enjoy this classic Cambodian cuisine on your travels to the Kingdom. This market is one of the landmarks of Phnom Penh. The Khmer name for the market is Phsar Thmei or New Market. The unique art deco building was designed by French architects in 1937. Spend time exploring the market after sampling the porridge. Price: $1.50 USD or 6000 Riel per dish. Look for the number G-123 for the best Kuyteav! 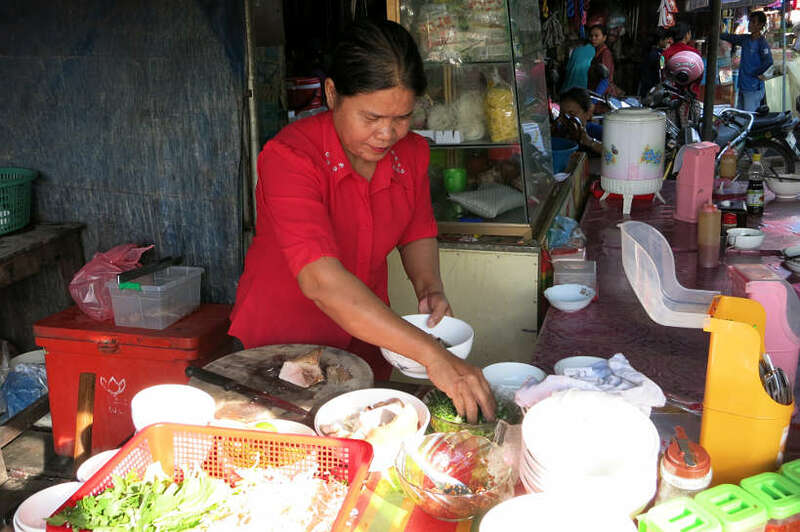 Bai Sai Chrouk is another popular breakfast dish in Cambodia. Made with pork slices marinated in coconut milk or garlic slowly grilled over charcoal. It is typically served with rice, pickles, and sometimes, a fried egg. Fresh tomatoes, cucumbers, and carrots are added on top. This dish literally means rice and pork. The skin of the pork is caramelized from the marinade, and the pork itself quite tender. It has a very nice sweet and salty taste. With the fresh vegetables, it is an easy meal to have at any time of the day. We had it at Khmer Women’s Restaurant in Phnom Penh. This simple restaurant is quite quaint and with outdoor seatings. Take a peek at the ladies cooking and grilling outdoors. The restaurant serves different kinds of Khmer food including Amok which we had on the same night. A highly recommended stop in Phnom Penh! Address: One block East from the corner of St 308 and St 29 in Phnom Penh. Beef Lok Lak is a very popular dish in Cambodia especially amongst the tourist as it involves “safer” and popular ingredients like beef. 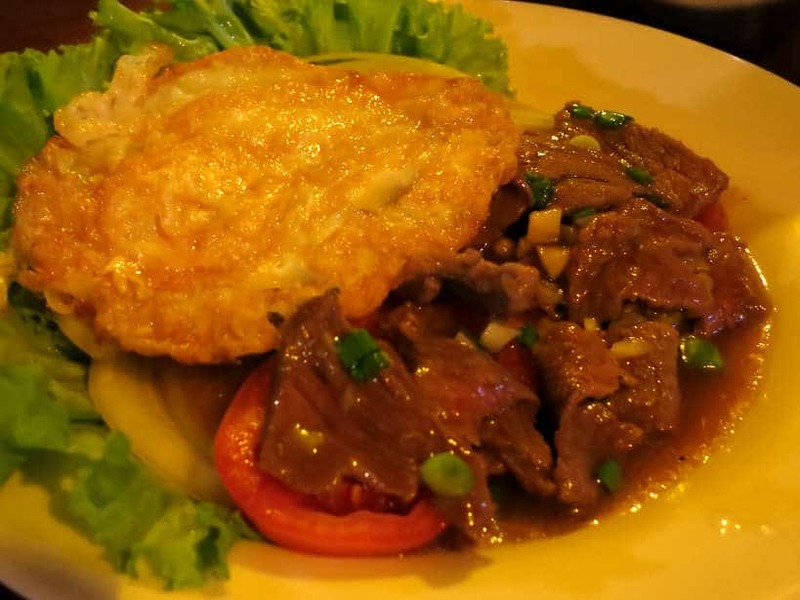 It is a Vietnamese inspired dish where the beef is cut into cubes before being sauteed. Typically, it is served on a bed of lettuce, red and green onions, cucumbers and tomatoes. 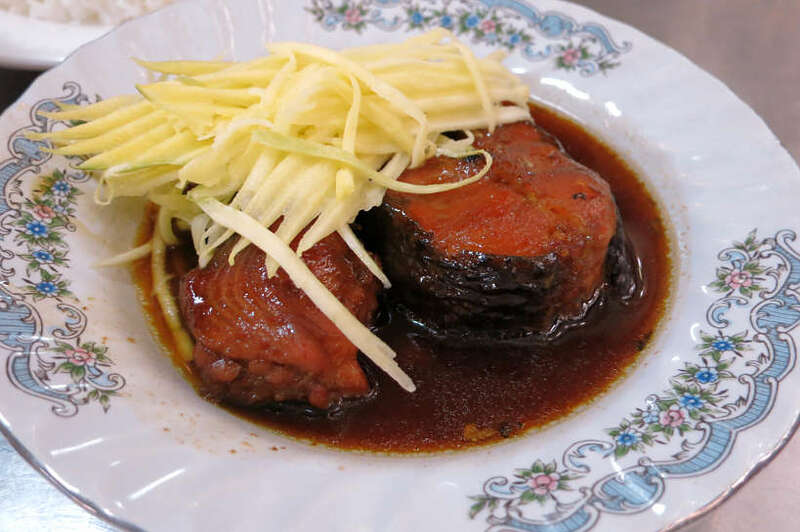 Beef Lok Lak comes with a light sauce made with lime juice, salt, and black Kampot pepper. 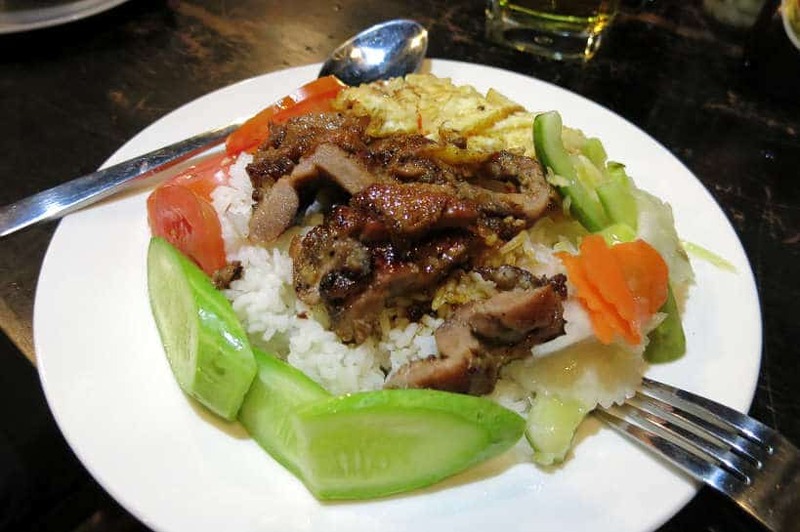 You might also get a fried egg on the side and of course rice, which is a staple in Cambodia. The version that comes with fries is the “westernized version” and you’ll want to stay away from this “not so local” option. 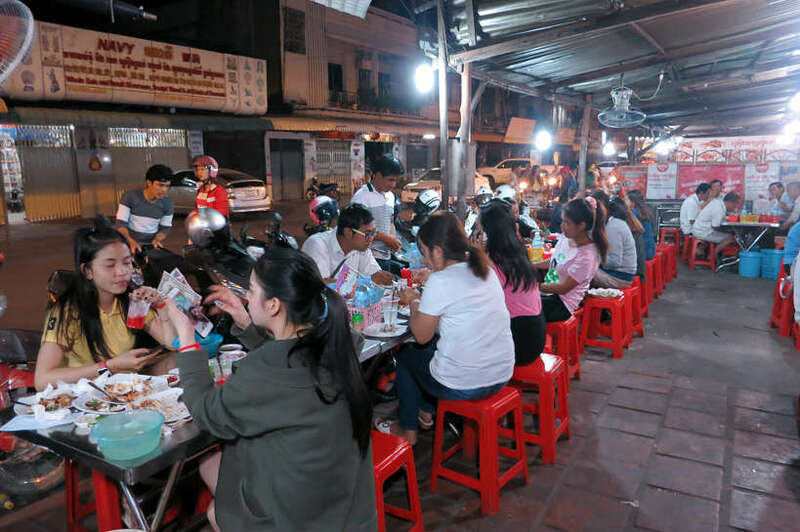 As mentioned previously, Beef Lok Lak is very popular amongst tourist. So it is an easy dish to spot on restaurants menus especially in Phnom Penh. 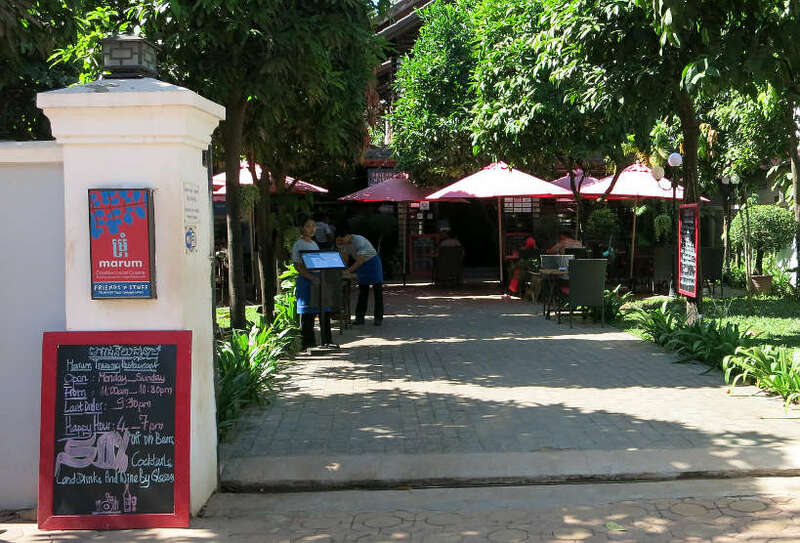 We recommend this delicious food joint in Siem Reap with outstanding local cuisine. On their English menu is where to find the Beef Lok Lak. Loved by most Cambodians, yet loathed by most foreigners is the signature aroma of Prahok. Prahok is a concoction of crushed and salted fish that gives off a pungent smell. 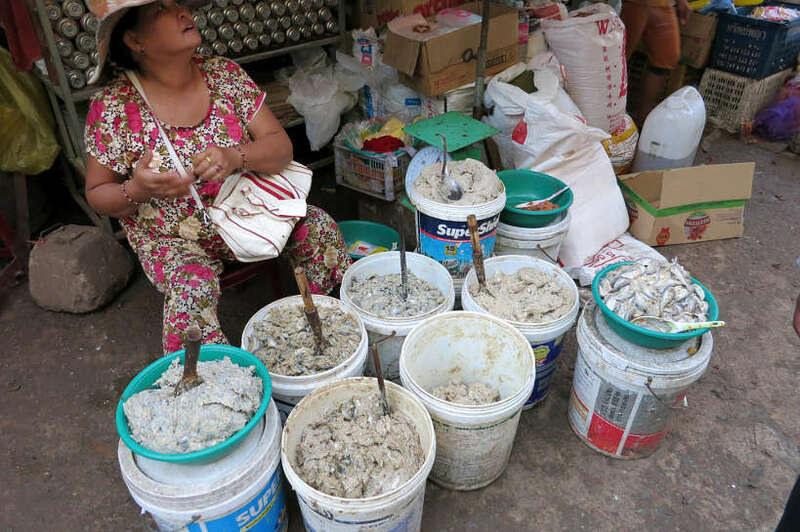 Grey in color and visually unattractive, Prahok is left to ferment until it matures. It is used as a condiment or seasoning in nearly every Cambodian food. Prahok is one of the main sources of protein in Khmer food. In the countryside, simple meals of prahok and rice are common. The stench of prahok in the markets was quite overpowering. As culinary explorers on the hunt for local and authentic foods, we had to find a way to taste prahok, a rare find on restaurant menus. Marum Restaurant in Siem Reap which serves delicious local food proved to be the perfect tasting ground. On the menu was a Khmer specialty of prawn and pork prahok dip served with local vegetables and crispy rice. What we thought would taste like it smelled, turned out to be incredibly delicious. The flavor combination of the prawns and pork was delightful. When we the dipped vegetables or crispy rice into the prahok, we found the experience quite enjoyable. 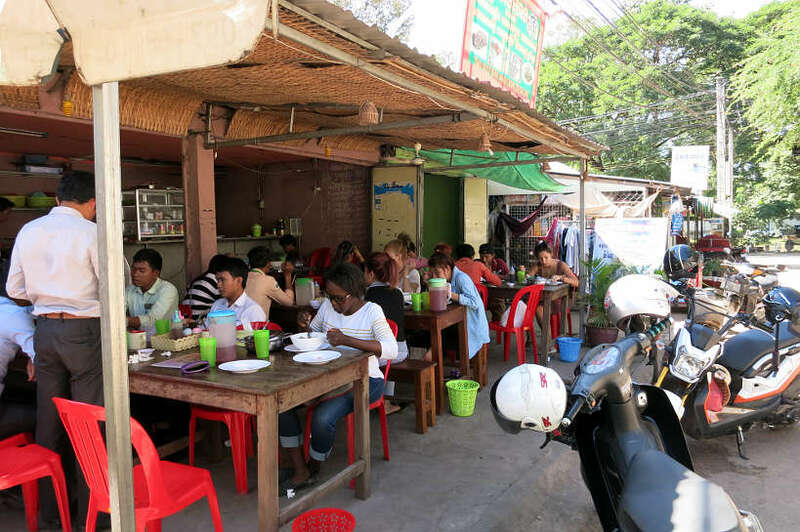 Eating at an NGO, fine dining restaurant in Cambodia is an experience not to miss. In Siem Reap, go to Marum restaurant. They offer a mix a solid local cuisine. The restaurant also works with street children and other marginalized youth and trains them in hospitality. You will eat good and feel good about eating at Marum. Hours: Everyday from 11 am to 11 pm. Cambodian cuisine really surprised us. Of all the countries we have visited on our quest, Cambodia is the only country where all sorts of insects are prominent on the menu. Insects became essential in Cambodia in the 1970s during the famine of the infamous Khmer Rouge years. Insects were seen and continue to be eaten as a cheap source of protein, especially for many Cambodian children who suffer from some type of malnutrition. 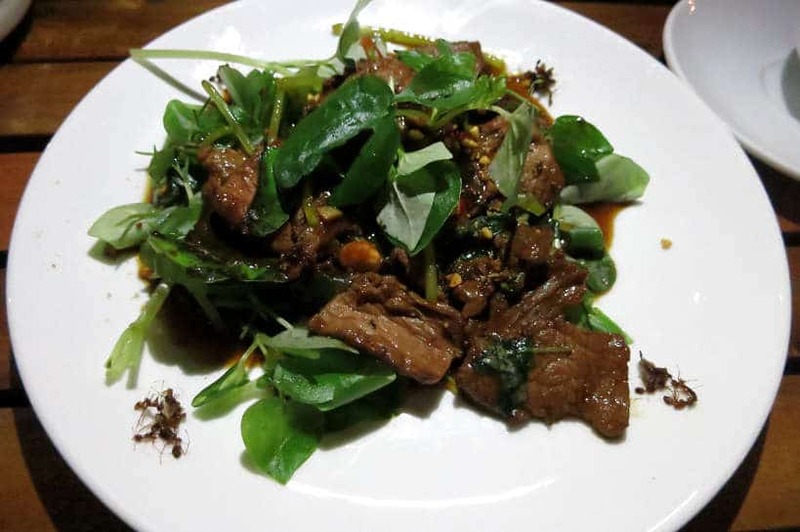 For an introduction to insects dishes, we tried the red tree ants with beef with kaffir lime and chili stir fry. The ants are stir-fried with lemongrass, ginger, garlic, shallots and thinly sliced pieces of beef. This simple is dish was accompanied with a side of steamed rice. 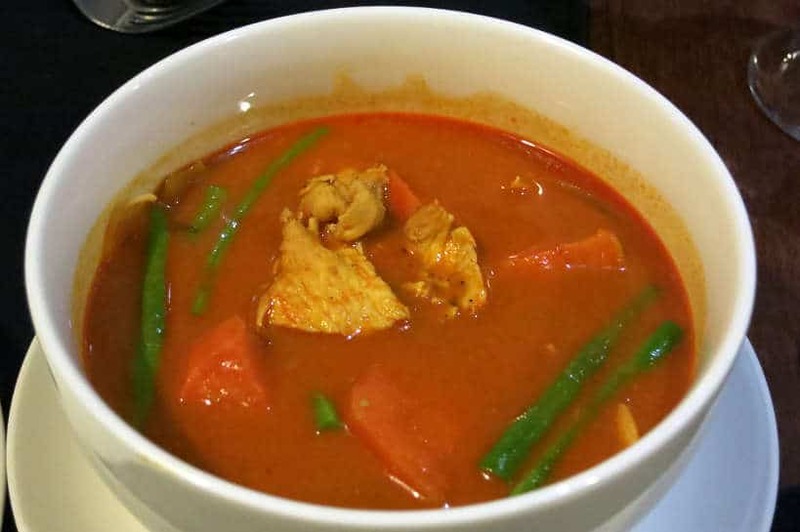 We were immediately intrigued when we first saw Khmer red curry on the menu. Our big question was whether it would taste like the Thai curries we had become familiar with. Khmer red curry we found out is not as spicy as in Thailand. The similarity is in using the coconut milk base, but without all the chilis. The dish also features, beef, chicken or fish, eggplant, green beans, potatoes, fresh coconut milk, lemongrass, and kroeung. We had this meal when we first arrived in Phnom Penh. Tired from our travels, we were looking for an easy dish that would be gentle on the stomach. We found the soup incredibly delicious with a wonderful coconut milk base and aromatic lemongrass flavors. The Khmer red curry was served with bread, which was unexpected, though we later learned that this is a remnant of the French influence in Cambodia. 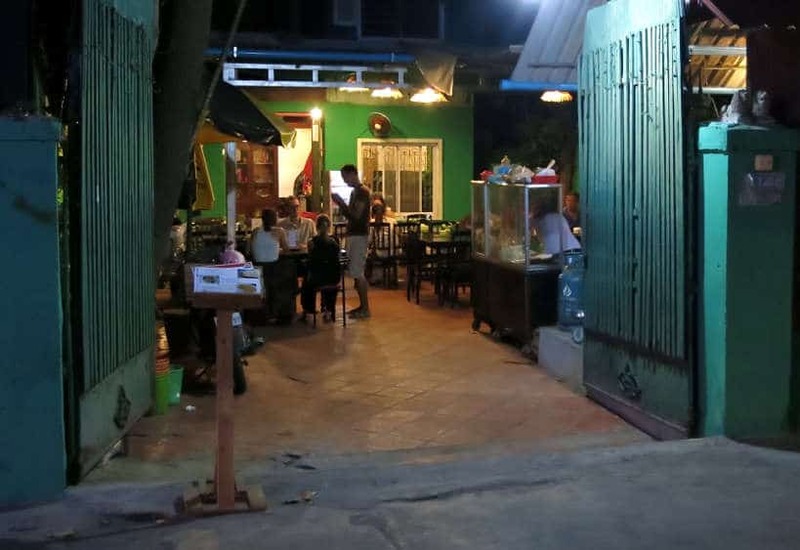 Street 63 is a small restaurant attached to a hostel in the expat district of Phnom Penh. It might not be the most authentic and local place. However, it is quaint and they serve Khmer food specialties on their menu. Hours: Everyday from 6 pm to 10 pm. Price: $3.50 USD per dish. Sour soup is another popular Khmer food. Cambodians have as many ways to make sour soup as they have seasonal and regional ingredients. The key is flexibility. 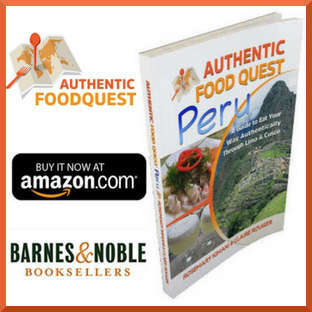 The ingredients often include lemongrass, galangal, cilantro and other local herbs, green onions, fish sauce, sugar, chiles and different meats or fish. The sour flavor, which is not as sour as the name suggests, comes from the use of tamarind and/or lime. We were surprised by the greenish color when the waiter brought us the chicken sour soup with Khmer spices we had ordered. The smell was interesting. Hints of basil with unfamiliar spices. The taste was also unusual. Slightly bitter greens and roots combined in a sourish broth. The pieces of chicken were succulent and full of flavor. Altogether, a wonderful exploration of this popular Cambodian food. Address: Wat Bo Road between Street 17 and Men’s road, Sla Kram Village, Siem Reap. Hours: Everyday from 9 am to 10 pm. Price: $6 USD per dish. Walking around the streets of Cambodia, you will find restaurants and street vendors selling fresh food from the grill. The most popular grilled items are fresh fish, seafood, and chicken. Fish and seafood are more consumed in Cambodia than meat. With the large freshwater network including the Mekong River and the Tonlé Sap lake, fish and seafood are predominant in Cambodian cuisine. When it comes to grilled seafood, squid is a popular item on the menus. For fish, you can find whole grilled Tonlé Sap, the fish from the famous lake in Cambodia. 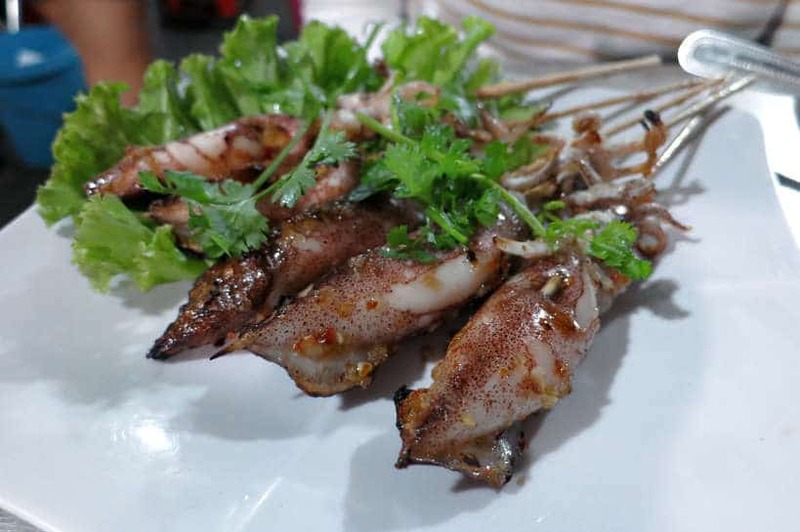 We had grilled squid at a popular local seafood BBQ joint in Phnom Penh. The squid is prepared grilled with salt, chili or other spices. We had the squid with salt chili which had a nice bite to it and the flesh was really tender. A definitely must try while in Cambodia. Grilled frog is another local delicacy. 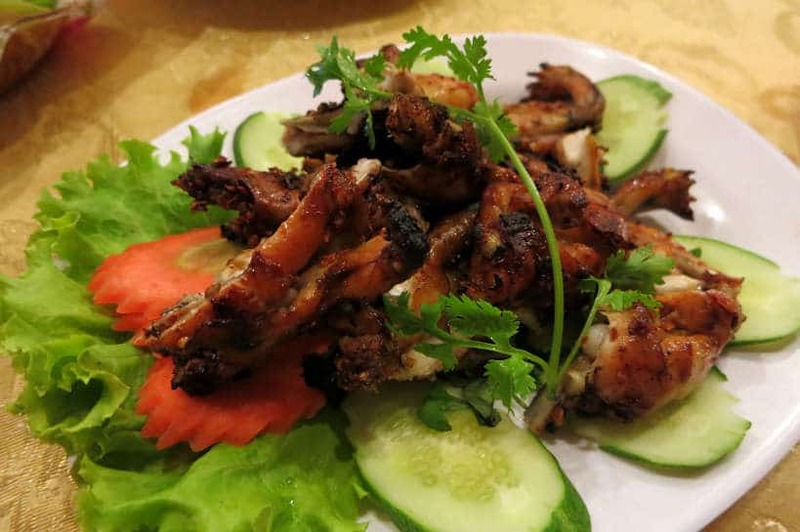 The texture of grilled frog is somewhat close to chicken and the taste similar to a white fish. Surprisingly, we found this dish delightful. Very simple, fresh and absolutely tasty. 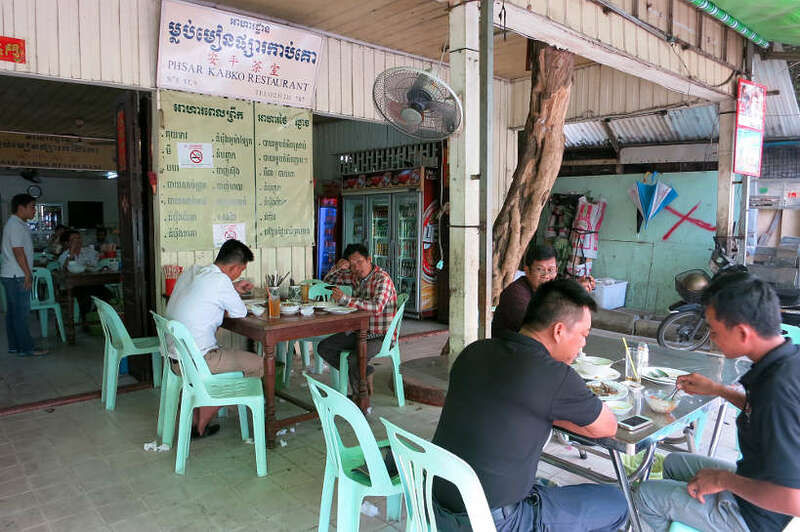 BBQ joints are commonplace in Cambodia. Some specialize in meat while other are more seafood oriented. Find the busiest seafood BBQ place along street 450 adjacent to the market, this is it! Price: 10,000 Riel (About $2.0o USD) for grilled squid. Price: 13,500 Riel (About $3.35 USD) for grilled frog. Cambodian cuisine abounds with fresh vegetables, and eggplant is amongst the most popular. This unique chargrilled eggplant dish has an intense and surprising smoky flavor. The eggplant is cooked whole on the grill for a few minutes. 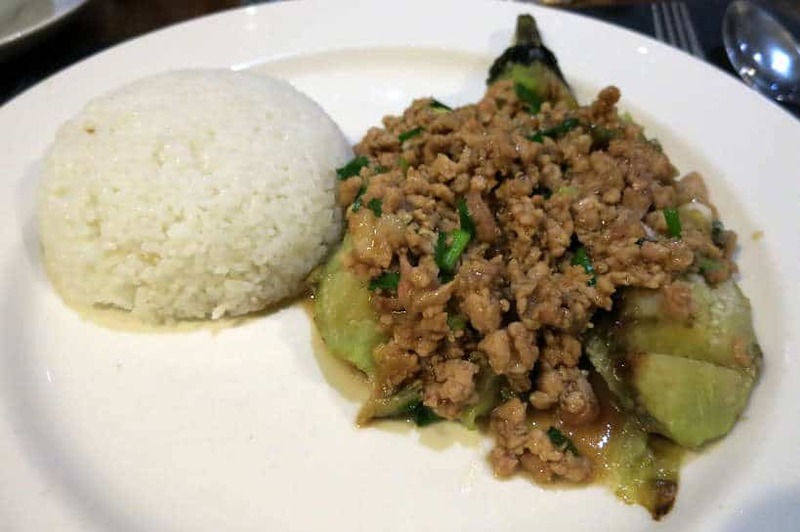 When the flesh becomes tender, the grilled skin is removed and the eggplant is served cut in half with the stir-fried pork placed on top of it. It typically comes with rice served on the side. The eggplant acts as a sponge and absorbs all the flavors. We had this dish a couple times. We found our first meal to be a bit too smoky to for our taste. On the following times we had the dish, the smoky flavors were much less intense. Be prepared for an interesting mix of flavors! The Chargrilled Eggplant and Pork is a popular dish on many restaurants menus. 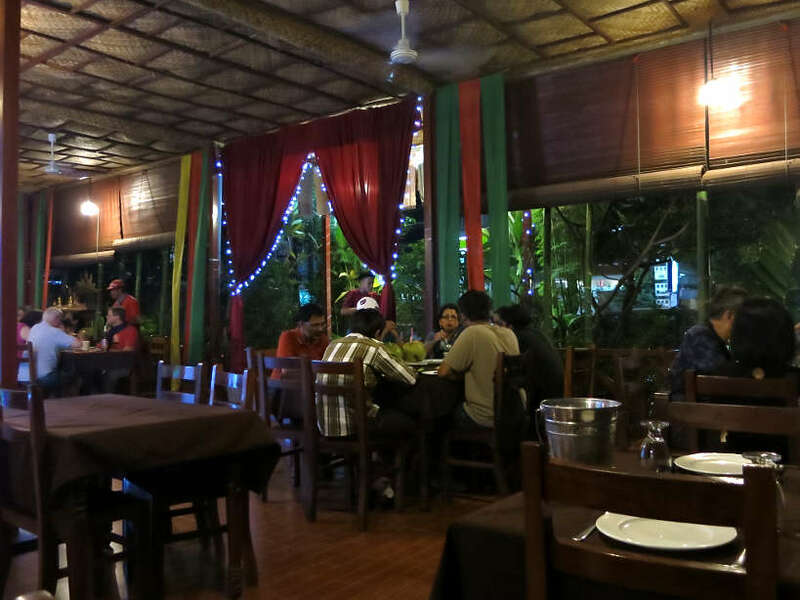 We had it at two different locations and recommend this Khmer restaurant in Siem Reap. Hours: Every day from 9 am to 10 pm. Freshwater fish from the Mekong River and Tonlé Sap Lake make up a large part of Cambodian cuisine. 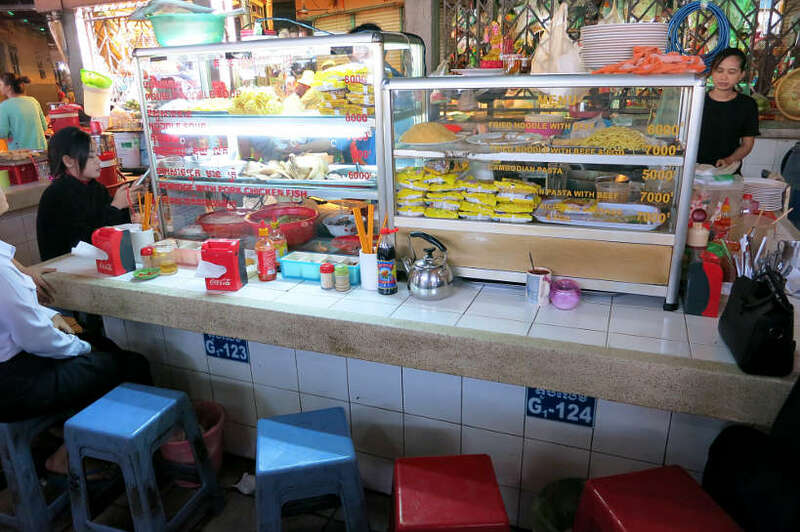 In Phnom Penh, we stumbled onto a busy local restaurant, that was not too far from a local market we were planning on checking out. This restaurant had two different ways of ordering. There was the menu, in English and with tourist prices. We had made the observation earlier of different prices for different people (tourists vs. locals). The second way to order was simply walk up to the counter and see what was cooking in pots behind the glass. The idea is similar to a buffet. Point to what you would like, and the cook will compose the plate for you. With each item priced separately, it was evidently much cheaper than ordering off the menu. This restaurant is very popular with locals, especially at lunch time. Located far from the tourist areas of Phnom Penh, it is worth seeking out. Address: Ke Nou St. (9) between Street 294 and Street 274, Phnom Penh. From succulent fish and seafood to distinct sour soups and crunchy insects, Cambodian cuisine will surprise more than one! Exploring Cambodian foods will take you beyond the common stereotype that Cambodian cuisine resembles that of Vietnam or Thailand. 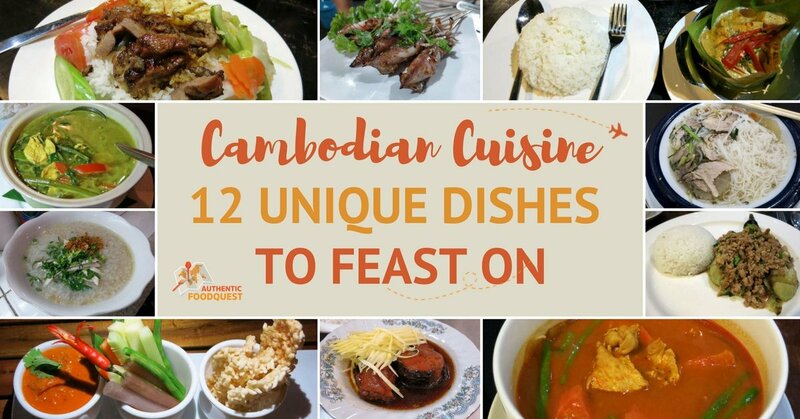 With these 12 Cambodian dishes, you will find out what make Cambodian foods so special. From Amok and Prahok, to Red Tree Ants, take the time to appreciate the unique smells, distinctive tastes of sweet and sour, and unusual textures -soft and crunchy that Cambodian cuisine offers. Cambodian cuisine definitely embodies our motto: Savor the Adventure! What Cambodian dish have you had before? Or which one would you like to have? Please share with us what tempts you with Cambodian cuisine! 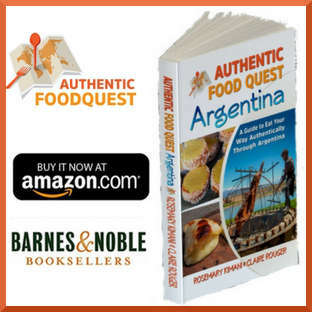 Get your free ebook on The 5 Best Ways to Find Authentic Food While Traveling and sign up for our monthly newsletter. 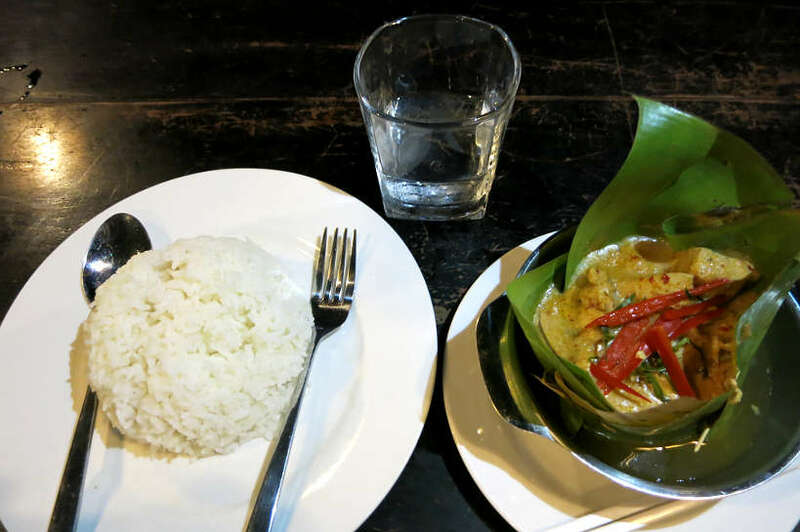 This post is making my mouth water and makes me want to go back to Cambodia right now! 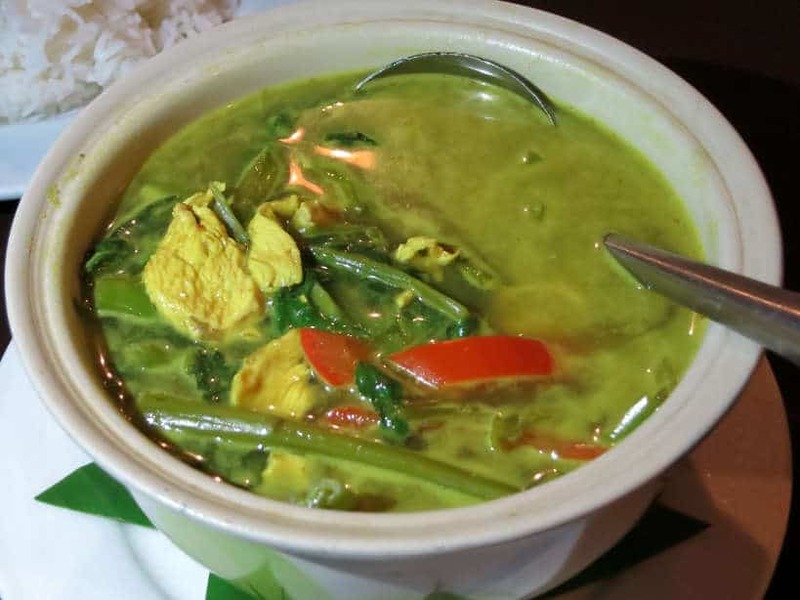 My two favorite dishes were the Khmer curry and amok! I probably ate those two 2/3 of our entire time in Cambodia! There are a few on here I hadn’t even tried, so what better excuse to go back?! You are right Megan, the food is a perfect reason to go back to Cambodia. Yes, the fish Amok was one of our favorites as well. 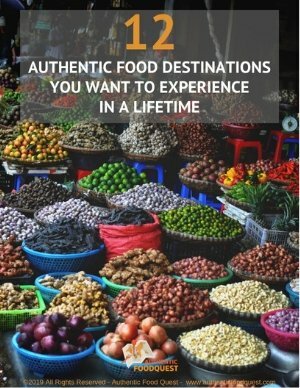 With this guide, you are certainly due for a delicious trip back. Cheers! That’s awesome that you can just came back from Cambodia. What part? Yes, totally with you on Fish Amok. We actually just wrote a new article about cooking Fish Amok. Check it out 🙂 The frogs were actually quite tasty…consider going back and branching out a little more with the food. Thanks for stopping by!! What type of fish do they usually use in the Fish Amok? It looks delicious and spicy. I’m sure i’d love it as I like Southeast Asian food. The most traditional and typical fish used in Fish Amok is river fish from the Mekong River. It is quite delicious and with its own unique flavors. Definitely worth trying out 🙂 Cheers. You are too kind Melody. Thank you for the wonderful compliments about having our own show…we would love that!! The food in Cambodia is quite diverse and tasty and the eggplant/pork is quite good. You’d love it! Hope you can get over to Cambodia and try out the food soon. Cheers. You would love Cambodia Megan, the history is rich and the temples fascinating. For us, the food is quite the ultimate experience. All the dishes as you mentioned are unique in their own right and full of interesting flavors. Definitively a must visit and must eat experience. I sincerely hope you do get to visit Cambodia soon. Cheers! I didn’t realise at all what a rich and differing variety of food Cambodia had. From the photos, I think my favourite of those dishes would be Bai Sai Chrouk but they all look tasty. We are so glad to hear that Rhonda. The food in Cambodia is much more diverse than most think…and delicious! The Bai Sai Chrouk is a favorite as are many of the others. Indeed a foodie destination!! These all look so delicious! One thing I really appreciate is a savory breakfast. I don’t much care for sweets so I’d much rather have these types of breakfast. The eggplant dish looks really great also. I had some of these but not all of them. That’s a good enough reason to go back! So great to hear that you prefer a savory breakfast. I was surprised at how quickly I adjusted to the savory soups and porridge as well. Glad you’ve had enjoyed most of these dishes. Any favorites? The eggplant is indeed quite tasty and a favorite of ours as well. Totally, the food is a good enough reason to go back! Cheers. I’ve been living in Cambodia for two years and you hit on so many excellent Cambodian dishes in this post! A lot of people don’t think of Cambodia as a place for foodies, so I think you are dispelling that myth. You also mentioned many great restaurants around Phnom Penh that are popular with locals and expats. 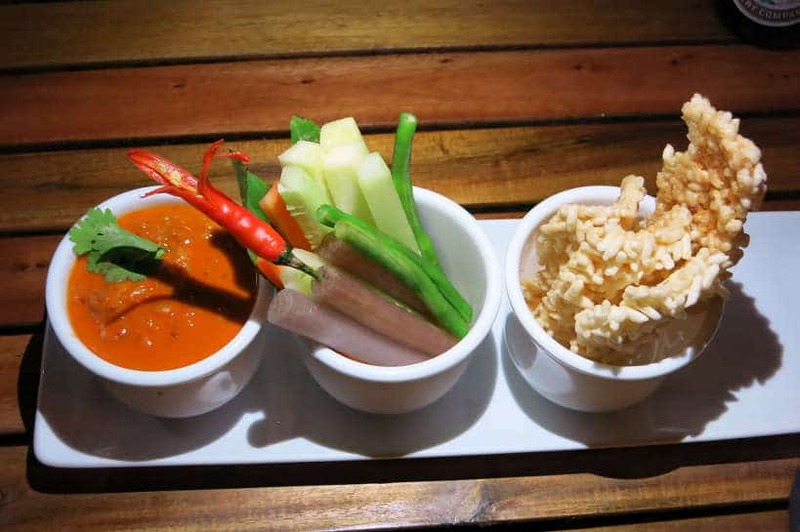 I haven’t tried to prahok at Marum restaurant yet, so will have to give that a try next time we’re in Siem Reap! That’s awesome to read Jen and we really value your feedback. Indeed, Cambodia has so much to offer around food and so little information is out there. 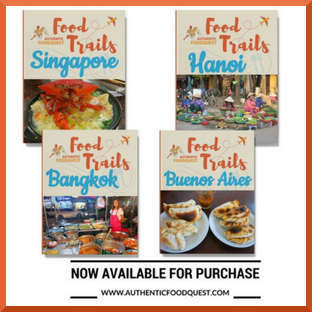 We hope we can inspire people to try the local flavors on their visits to Cambodia. You will love Marum…but book ahead! Appreciate your feedback. Thanks. The fish with shredded mango sounds delicious. The rice porridge sounded great until you mentioned offal. Nope. Plus I prefer sweet rice porridge like in India. I guess I’m not as adventurous an eater as I thought. That’s funny to read Penny about the rice porridge. The good news is that you can ask for the offal to be removed and simply enjoy a savory porridge. Have not been to India yet, but the sweet porridge sounds delightful. 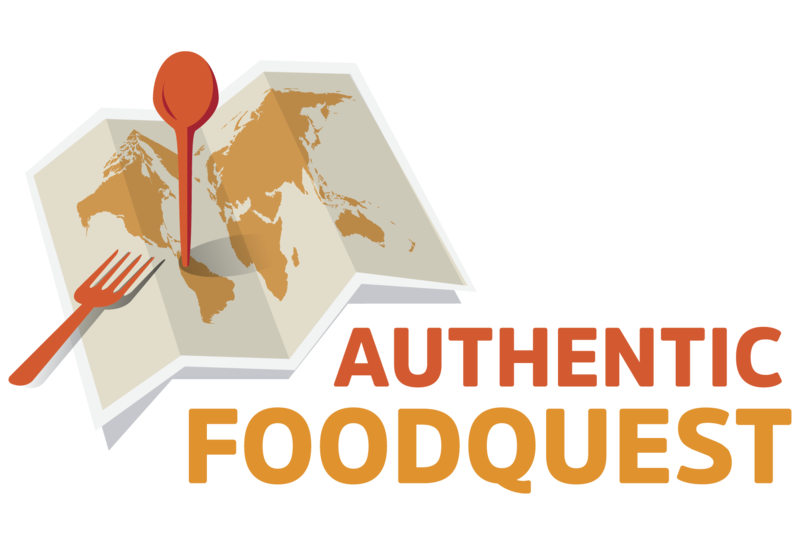 Indeed exploring the local flavors does require courage to step out… even a little bit! Thanks for your comments. You are most welcome Carmen…it is indeed difficult for us writing about the local flavors while hungry!! Cheer . We understand what you mean…it’s difficult for us as well to write on an empty stomach 🙂 Glad you enjoyed the article.